Offering valuable services and member benefits to seasoned professionals, employers and students with an interest in the paralegal profession in Nebraska. 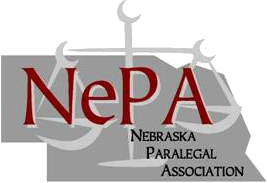 There's something for everyone in the legal profession at Nebraska Paralegal Association ("NePA"). Whether it's industry-leading information from our official In Brief Newsletter, continuing education seminars, the latest in careers across the state or just basic information about the paralegal profession, NePA has it. We've delivered the best and most relevant resources for paralegals in the state since 1976 when we were formed as a non-profit organization. Our membership comprises over 200 paralegals, educators, attorneys and representatives of companies providing services to the legal community. We support members through social events, learning opportunities, scholarships and more. Find those resources and more here. Whether you're a current NePA member and are just looking for a renewal form or are just visiting the site you'll find a lot of valuable resources about membership here, from the benefits we offer to upcoming events and programs that might interest you. We want to recognize our Diamond sponsors Capitol Services and Gavilon for their support! You can see all of our sponsors, as well as get information on how you can become a sponsor, on the Sponsors page. Developing Defensible Deletion Strategies - Reggie Pool of HBR Consulting, LLC - co-hosted by Nebraska Chapter of ARMA. At Ameritas (5900 O St., Lincoln, NE) - follows modified schedule and will be buffet style BBQ. If you need vegetarian option - please contact Courtney Pfeiffer after you register.